Indeed this is a transnational pre-Brexit session, with Angus doing his farewell European tour and stopping in Turckheim. Just like Sir Paul would do, or would that be Ringo? Comes in this rather extra-terrestrial square bottle, but without a yoghurt pot in sight. Colour: straw. 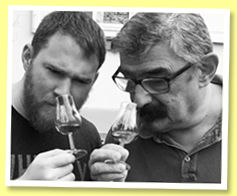 Nose: Angus actually thinks it is quite nice, it’s very on raw ingredients, fresh barley, grass, yeast, very sourdoughy… I think it’s less Bladnochy than earlier bottlings from the 2000s, you don’t have this very elegant lemony Bladnochy character, and rather more cereal than before. But we agree it’s a nice nose. The guy who invented the word ‘nice’ deserves a medal, if not a bottle. Mouth: rather creamier, with some flower seeds, more cereals, more grass, nice and fresh if not super-complex (says Angus). I would add that there are rather more limoncello-y notes than on the nose. Bitter lemon, that kind of thing people mix with gin to make gin drinkable, says Angus. Finish: rather medium, a wee tad chemical (instant lemon drink powder, something like Lemsip says Angus who uses that to cure his colds). Comments: some form of precision, more than in other whacky finished new siblings, and a sense of identity this time. Now we’re still a little far from those very citrusy older officials. SGP:551 - 80 points (Angus 80). Indeed the very first Bladnoch by the SMWS! Colour: gold. Nose: it’s a young lad! Very fresh and a bit cheeky, much more textural than the 10 yo says Angus. This oiliness and fatness and power… That Bladnoch butteriness is quite obvious as well, buttered brioche, lemon fudge I would say. Lemon curd… Sunflower oil adds Angus, rapeseed I would add… Probably some fennel seeds as well. With water: Angus finds jasmine and incense (need holidays, Angus?) while I’m rather finding lemon curd and cantaloupe melon. Or another kind of melon. Those green ones that look like a rugby ball. Mouth (neat): like an aged riesling, with a petroly side, some butteriness again, some chenin blanc and even some grassy sauvignon. This is totally a wine-whisky. Some white pepper, a little limestone, new breeze blocks, and once again some limoncello. With water: excellent, becomes a bit waxy says Angus, and Angus is right. Quite some pollen and wild flowers. Rich pollen note. Finish: good length, perfect balance, a little herbal, and perfectly citrusy/waxy. Comments: classy well-carved old Bladnoch that swims like a salmon from Rothes (says Angus, who knows a lot about salmons). SGP:651 – 90 points. Angus 91.